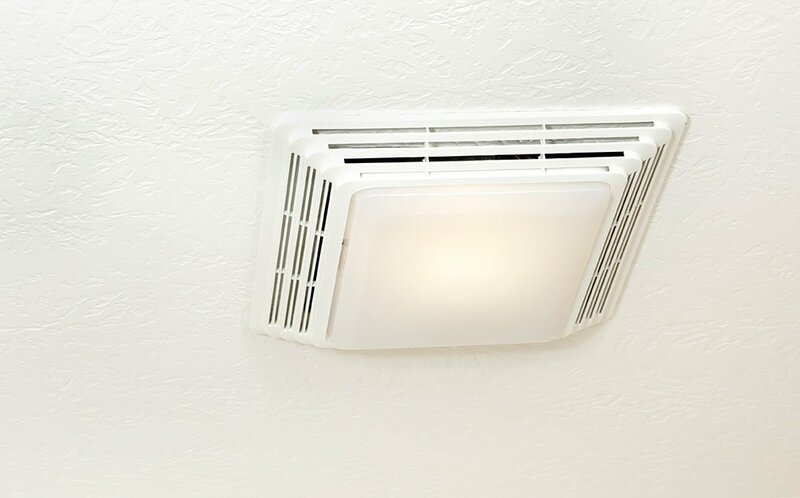 A ceiling exhaust fan removes excess moisture and objectionable odors and makes your bathroom a pleasant place to be. Choose a ceiling fan with enough power to change the air in the room quickly. You should let the fan run long enough to make sure it completely gets rid of the moisture. Often people turn the fan off too soon, before its work is done. A timer switch will ensure that your fan runs long enough. Some fans have built-in timers or humidistats that turn the fan on and off as needed. By removing excess moisture from your house, your fan will reduce mold and mildew growth and prevent rot. Mold and mildew causes allergy and asthma symptoms in many people. Never vent an exhaust fan to your attic since this can cause undetected mold growth and wood rot. The damp wood could attract termites as well. Your fan must vent to the outside. Since steam from a shower rises, the best place for your fan is on the ceiling between two joists or high on an exterior wall. A fan can be installed lower if necessary but will need a more powerful motor. The CFM or cubic feet per minute rating of a fan shows how much air the fan moves. A room that is 50 square feet or less needs a fan rated at 50 CFM. If your room is larger than 50 square feet, determine the fan power needed by counting the fixtures like toilet, tub or shower at 50 CFM each and jetted tub as 100 CFM each. A separate toilet room requires its own fan. If the ductwork needed to remove the air is long, the fan power will need to be stronger to move the air outside. Different types of fans offer features such as lighting, heaters, and automated timers. Some come with a humidistat so they will run as needed. Some have mobile device connectivity to stream music through a built-in speaker. Energy Star® qualified fans provide better efficiency and comfort with less noise and have high-performance motors with improved blade design for longer life. Learn more about the benefits of Energy Star here. If you feel unsure of your skills to install the exhaust fan yourself, consider hiring a qualified electrician. Your electrician will properly and safely install your fan and make sure it is vented to the outside. Contact Bausum & Duckett Electric for a free estimate for your next electrical project.